This month our topic is all about translation quality with our guest, John Hooper (also known as GundamAce) of Lemnisca! Regrettably, technical issues irrecoverably destroyed a great talk we had about honorifics, and we were unable to reconstruct it in time, so if you notice that we don’t talk about those, we’re sad about it too! 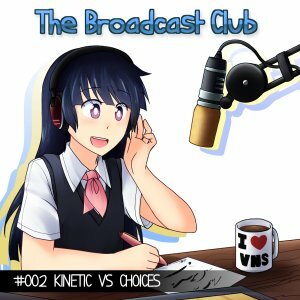 This month our topic is kinetic visual novels vs. visual novels with choices with our guest, Avebone. Welcome to the homepage of The Broadcast Club visual novel podcast. Our goal here is to provide interesting content on a roughly monthly basis with new topics and rotating guests. The first episode will be about English Visual Novels and feature Nai as a guest! Look forward to more information and the first episode soon!